Being the next Mark Zuckerberg requires Americans to be gutsy and start companies. Lately, they're not doing it. 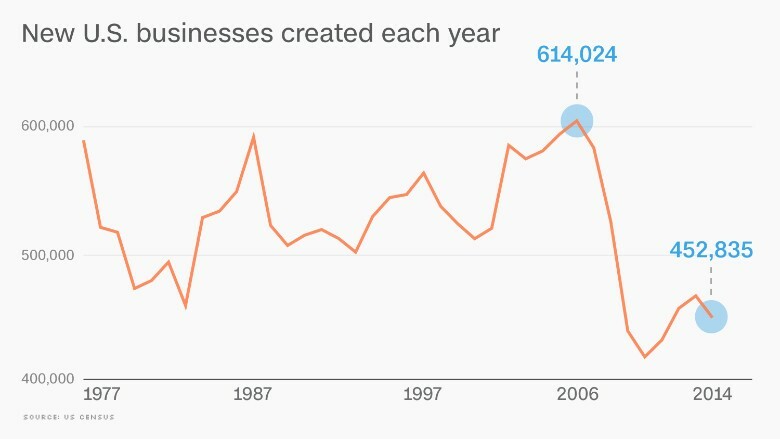 New business creation in the U.S. (a fancy way of saying "startups") is at nearly a 40-year low. Only 452,835 firms were born in 2014, according to the most recent U.S. Census data released in the past week. That's well below the 500,000 to 600,000 new companies that were started in the U.S. every year from the late 1970s to the mid- 2000s. "There's been a long-term decline in entrepreneurship," says Arnobio Morelix, a senior research analyst at the Kauffman Foundation, which tracks startups. The Great Recession was a great killer for startups. Americans didn't start new businesses because few had the money or the guts to do it in those gloomy days. But the expectation was that America's great entrepreneurial spirit would rush back as the economy recovered. "We should be sending off yellow flares now," says Mark Zandi, chief economist of Moody's Analytics. "We're far enough away from the dark, gravitational pull in the recession and crisis. People should be more willing to take risk." The big question is why this decline is occurring -- and what it means for jobs. Historically, new businesses were doing most of the hiring in the U.S. Experts like Morelix of the Kauffman Foundation and Zandi from Moody's point to three main factors that could be causing the big startup slide. 1. The "Walmart-ization of America" -- There's been a huge shift to national chains versus "mom and pop" shops, says Morelix. Small businesses have found it hard to compete with the Walmarts (WMT) of the world on price because they lack the infrastructure needed to source cheap goods from overseas. Plus, outsourcing and automation can now take care of tasks that young small businesses used to provide such as local accountants. 2. Regulation -- Opening a business, even a simple local shop, requires more and more licenses and permits. Consider that almost no new banks have opened since the crisis and Dodd-Frank. Companies have also put more "non-compete" clauses in contracts to forbid current employees from leaving and starting their own firms, at least for a few months or years. 3. Big companies are getting more entrepreneurial -- The startup culture has permeated big business now too, says Zandi. Look at Google (GOOG) and Tesla (TSLA). They have research and experimental divisions that young people are hungry to join as opposed to doing it on their own. Where are the startup jobs? On top of the factors hindering startups, the new businesses that do get off the ground don't employ as many people as they once did. Instead, established companies have been hiring quite aggressively since the Great Recession. "The bigger guys are creating a lot of jobs," says Zandi. 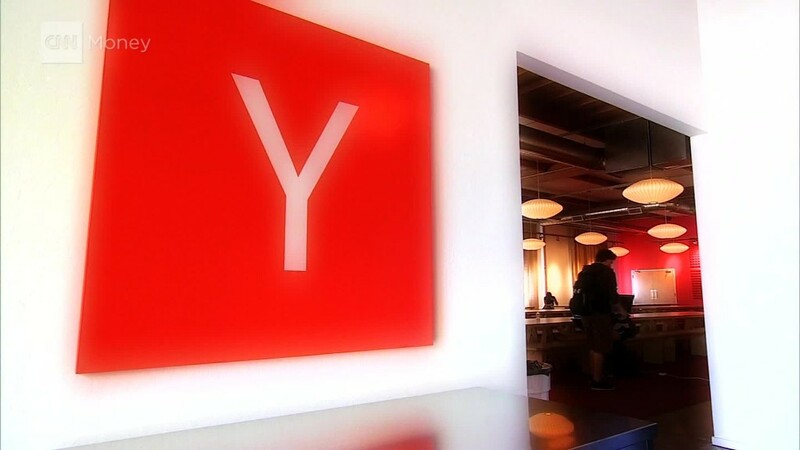 "We're not getting the same juice from smaller companies and startups." The U.S. Labor Department keeps track of how many new jobs come from businesses that are less than a year old. 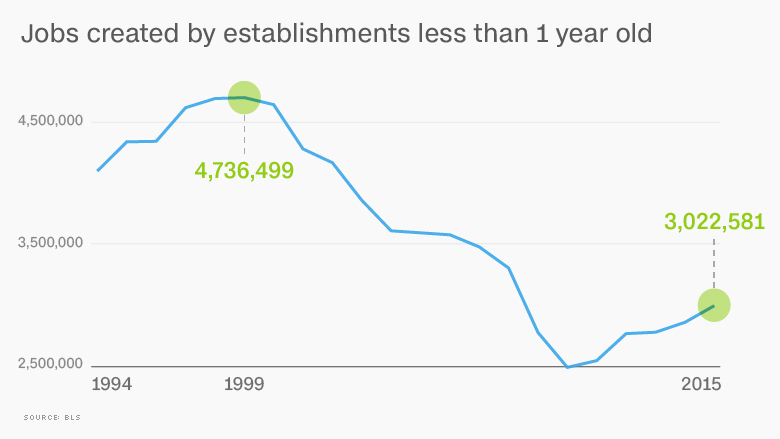 It peaked in 1999 -- the dot-com boom -- when 4.7 million jobs came from young startups. Last year, only 3 million came from startups. Related: The U.S. economy's biggest problem now: the smartphone? There's hope the startup slump could be bottoming out. Americans love watching TV shows about startups such as HBO's comedy series "Silicon Valley" and ABC's "Shark Tank," where entrepreneurs pitch their ideas for cash. In other words, startups still have cultural cache. Beyond that, the Kauffman Index of Startup Activity has shown a sharp spike upward since 2014. Even the Kauffman Index isn't quite back to pre-recession levels. But lately, it's getting there. The U.S. is also primed for a Millennial startup boom. Most people start companies in their 30s, notes Zandi. Millennials are just getting to that age. "If policymakers did nothing, conditions for startups would likely improve," he says, although he would like to see more talk about it on the campaign trail. Zandi also points to the Labor Department data, which is released more frequently than the Census numbers and has shown a "nice pick up" in new businesses. 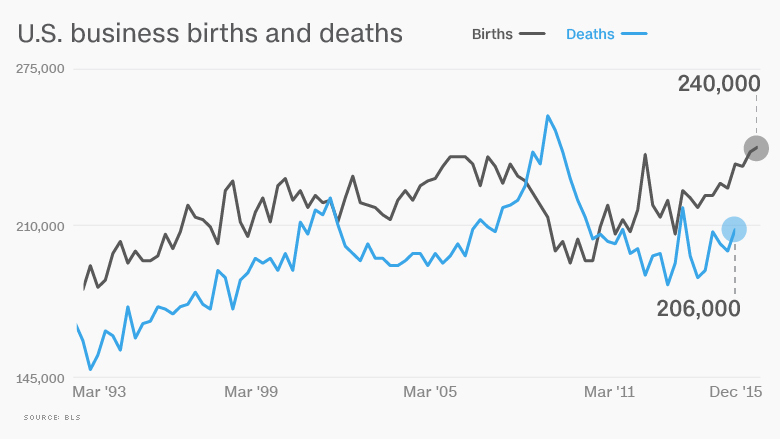 In fact, new business "births" now significantly outpace business "deaths," according to the Labor Department. It's a positive trend that has accelerated since late 2013. So what should the U.S. do to really turn things around? "Immigration reform would be the single most important thing to do to juice up entrepreneurship quickly," says Zandi. Corporate tax reform could also help to level the playing field for the little guys and big guys, he argues.